Our new top-of-the-line home gym system delivers the ultimate total body workout in as little as 10 to 20 minutes a day. 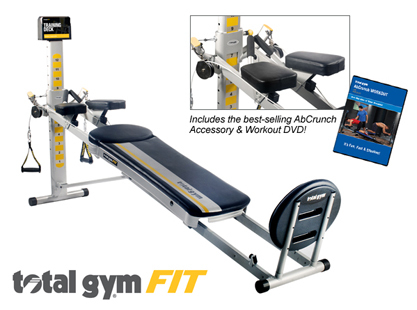 The FIT takes your workouts to the next level with twice the resistance levels, our best-selling AbCrunch attachment, Workout DVD, an updated 2-Piece Wing attachment for wider range of motion, an Ergonomic Glideboard and more. Every detail of the new Total Gym FIT was designed to deliver the most efficient and effective workout. The versatility of the Total Gym FIT is perfect for all fitness levels from beginners to even the most advanced fitness enthusiasts. Arrives fully assembled and includes all the workout tools, DVDs and accessories needed to get you in the best shape of your life. Total Gym FIT targets ALL the major muscle groups simultaneously – providing resistance training, cardio training and stretching all on one total body workout machine. A terrific piece of resistance training equipment for your home, the FIT includes customized workouts for men, women and kids with workout programs from beginner to advanced, delivering a total body solution that the entire family, at every fitness level, ages 8 to 80, can enjoy. Total Gym is trusted by more than 4 million consumers to provide excellence in product design and functionality. Start It Up DVD! 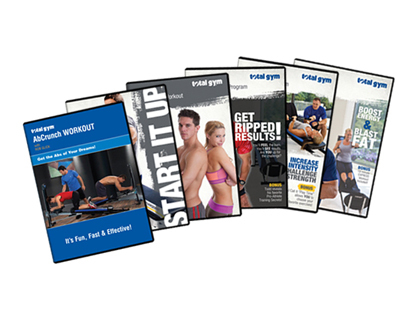 – Your very first Total Gym workout! Beginner Program with Todd Durkin to jump-start your fitness and increase your strength, stamina and energy. Intermediate Program with Todd Durkin to step-up your game by challenging strength, increasing intensity to build muscle & burn fat. 5-Day Advanced Program with Todd Durkin (Separate Upper Body & Lower Body Workouts) designed to get you ripped. In addition to your limited lifetime warranty on the frame, you’ll receive a 2 year warranty on all moving parts. 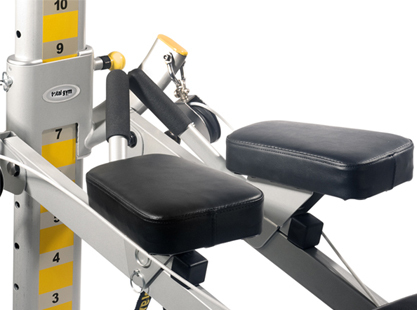 We stand behind each and every Total Gym machine sold. Your order will be handled before all other orders, so your shipment gets to you faster than the average order.